Courtenay, B.C. – The BC Government’s Mining Code Review is a good first step towards preventing another Mount Polley tailings pond disaster, but fails to look at the broader changes needed to make mining safe and sustainable, says a joint submission by concerned groups. 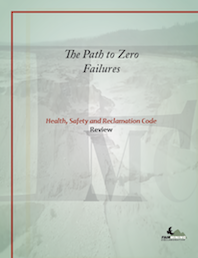 Fair Mining Collaborative (FMC), in partnership with MiningWatch Canada and Northern Confluence today released a comprehensive document, detailing how BC mining laws should be updated to prevent future tailings storage facility disasters like Mount Polley. The analysis was filed as part of the public comment period for the BC Mining Code review. Broadening the scope of the current limited HSRC review by conducting a public review of all statutes that regulate mining: Mines Act, Mineral Tenure Act, Environmental Management Act, and Water Act. “Without a comprehensive review of all BC’s mining legislation, BC can’t fully implement the recommendations of the Mount Polley Independent Expert Engineering Panel,” said Mr. Grande. Creating a permanent provincial Independent Tailings Review Board and site-specific Tailings Advisory Committees to oversee the management of all tailings storage facilities in BC. First Nations, NGOs, and community representatives should officially participate in these committees. Moving drastically away from conventional, wet saturated tailings production and switch to paste or thickened tailings, or to a combination of Best Available Technologies. The Independent Expert Engineers Panel recommended BC move away from conventional tailings storage facilities, and require mines to use alternative methods like dry stacking tailings. “We encourage BC to become a world-leading jurisdiction by ensuring every new mine, including those that have permits but are not yet built, use the best available technology. We cannot afford to take economic shortcuts that endanger watersheds and communities,” said Ms. Crook. Strengthening mandatory securities, requiring new securities for emergencies and accidents, and a full-cost analysis of potential tailings dam failures at the project outset. Recent polling shows that more than 90 percent of British Columbians support increased financial assurances. 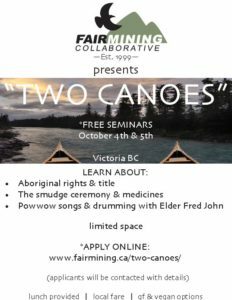 Adopting the principles of Free, Prior and Informed Consent and recognize First Nations’ inherent right to self-determination and self-governance throughout all aspects of resource development.